Thanks to a $160,000 Great Lakes Fishery Trust Fund Grant, the upper level of the beach house has been turned into an interpretive and interactive area. By mid-June 2016, two large aquariums should be in place, one for salmon and one for lamprey. The picnic tables on the second floor will have customized graphics installed to give visitors additional information as they eat their lunches. There will also be reader rails on the outside, so visitors can be on the veranda and read text to help better understand Lake Michigan. Two movable pedestals have been installed that contain electronic video displays about Hamlin Lake, the park, and Great Lakes Fisheries. Plans are also in place for a large touch screen television to be installed. During the winter and spring of 2013, renovations were made to the beach house, which included a new roof and the replacement of the outer layer of bricks. The building was stained using the color from the 1935 Beach House. The second floor, which was once subdivided into two different areas is now one large room, complete with hardwood flooring. A fireplace still occupies the south end, and there are doors on three sides that lead out onto the veranda, which was also restored. Possibilities include a counter with bar stools so people have a place to sit, read, have a cup of coffee...all while listening to the waves splash on shore. Visitor Services occupy this floor, with both permanent and seasonal exhibits that depict the Park's natural and cultural history. The main focus will be on Lake Michigan's geology and ecology. The upper level is accessible by a new staircase on the north end. 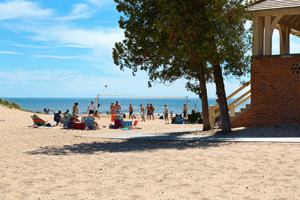 The Lake Michigan Beach House will be open during the spring, summer and fall, depending on weather.